Discussion in 'Buck Knives' started by jec88, Mar 6, 2012. New poster, found this site looking up info on my new-to-me Bucklite 422, with a symbol than almost looks like an A so from what I can tell a 1988. I carried a Bucklite for at least 15-18 years. It was my first real knife, I remember buying it new at a Wal-Mart when I was just out of high school. For some reason, it was missing the sheath and so it was marked down and on sale. I liked the way it was light in my pocket, and easy to open with short fingernails. One day I was working on my boat in the driveway and left it laying in the boat and someone decided they wanted it. 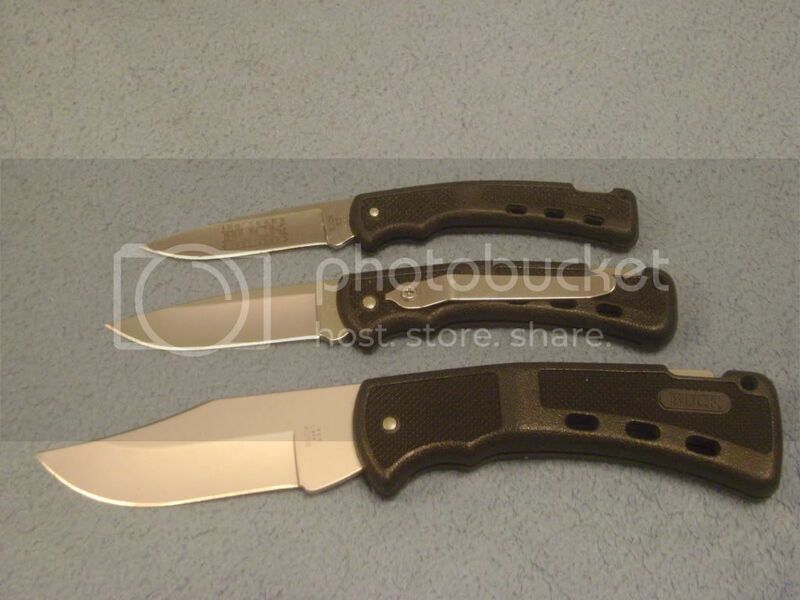 That was a good 6-7 years ago and I've bought alot of knives trying to find one I liked as well. Saturday, I just happened to go into a flea market across from my kids school and found my "new" Bucklite 422 for $10. Not the exact generation as my old one, but close enough. 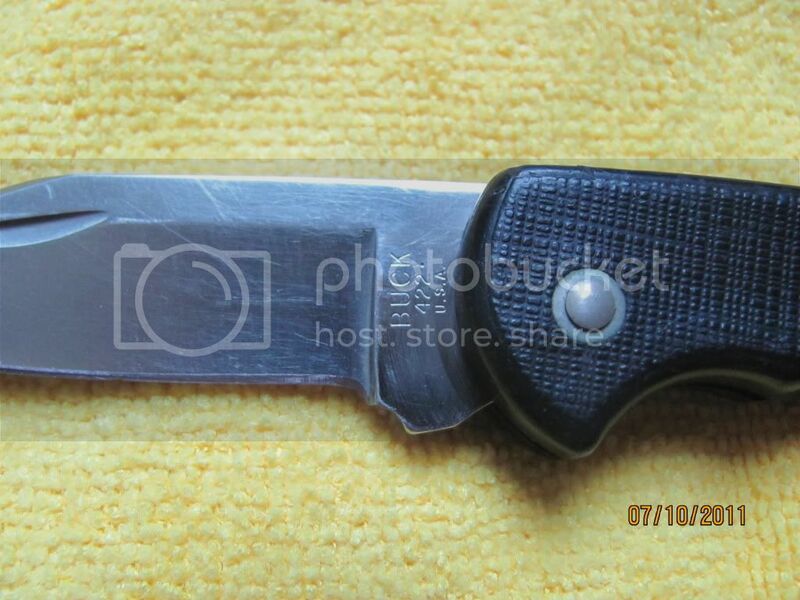 Blade looks like it might be a hair shorter where it could have been broken and fixed, but it might be made that way and just a little different blade than my last one. I just got one as well. 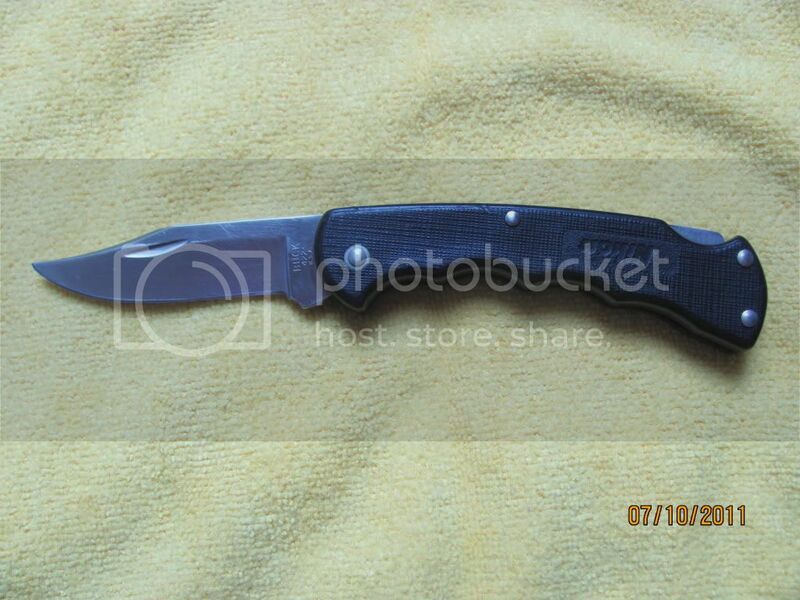 Nice knife but maybe a alittle too short for my tastes. It has the one dot to the side, but some reading has suggested that does not have much to do with the "dating" of it. jec88, welcome to the forum. I love the Bucklites as well. I only have one 420 series, this 1st generation 422, which I assume is like your original. THe one you have now is the more squared off version with the lateral lines? Yours looks just like my original one except mine was olive drab. Yes my new one has the lateral lines. Bucklites are very collectible in the fact that there are so many versions and variations, just ask Its Too Early. Sounds like the one I picked up. I will drop a photo this afternoon. Also, how are the newer ones? I saw a Bucklite 3 on the web specials on Buck's site and contimplated buying one.